The hectic schedule of many working moms (shout out to all the single moms as well) can be daunting. Between jugging your home and work obligations, it can be difficult to find the time for yourself. It’s so easy to fall out of shape and feel miserable as you think control is slipping away from you. It need not be like that, and there are plenty of solutions for your trouble. One of the most effective ones that I want to share with you is rebounding. Rebounders (or mini trampolines) look similar to the big, bulky backyard trampolines, but serve a wholly different purpose. MIni Trampolines or Rebounders – What Are They? Rebounders are smaller versions of trampolines, usually between 28 and 40 inches in diameter, that are used indoors for bouncing (rebounding) exercises. Compared to regular trampolines, rebounders are stiffer and aim to provide resistance instead of a high bounce. There are plenty of rebounders available on the market, from cheap $30 units to $400 pro pieces of equipment. Most are foldable and easy to carry around or store when unused. Rebounders are made mostly for adult exercise. Even though they may look similar to kids’ trampolines, they are made completely differently, with a goal of fostering exercise instead of fun and entertainment. Rebounders come in several flavors: some use bungee cords as springs, while others opt for regular coiled springs. Generally, springs last longer than bungee cords, which can be found on low end, cheap trampolines. However, expensive units also have similar cords that are made of high quality material, and are much quieter than regular springs. What are the benefits of rebounding? The benefits are numerous – and it’s been proven. Trampoline research from NASA has shown that rebounding is among the most effective ways of exercise – on average, an adult will burn from 300 to 400 calories per hour while bouncing on a trampoline. Overall, trampolining is about 68% more effective than jogging, i.e. you will do more effective work from your time exercising. In fact, bouncing on a trampoline for 10 minutes can be as effective as half an hour of jogging when it comes to cardiovascular benefits. Rebounding is also fantastic as a great low-impact exercise. Running basically puts a lot of stress on your tendons and bones, especially the ankles. Rebounding distributes the forces linearly across your entire body, making it an excellent way of exercise for those with pain or previous sprains. But the plus points don’t end there. The G-forces created during bouncing further strengthen the muscles and bones – especially important for middle-age women who are at risk from osteoporosis. Also, the constant balancing motion to help you stand on the trampoline requires hundreds of muscle micro-contractions orchestrated subconsciously by your cerebellum. All this improves your overall muscle tone and look. There is also evidence that regular rebounding boosts immune function and lymph drainage. Stress reduction is a given, especially if you exercise in the evenings after a rough day. You’ll sleep much better and feel more energized the next day. It sounds counter-intuitive, but it really is true. Try it out! How Long Can I Exercise for? That’s yet another benefit. You’ll get much less tired on a rebounder, even though you’ll be spending calories by the hundreds. That means you can exercise more and make the best out of your time. For starters, we recommend you spend 15-20 minutes a day unless you get the hang of it, and then you can advance to half an hour (you can break this down into several smaller periods if you find that easier). Not to mention that you can exercise while watching TV or listening to your favourite music – it’s that convenient! That depends on what you need. The cheapest serviceable rebounders start just shy of $30 and are a great way to get you into the action. One such rebounder is the famous Stamina 36 inch rebounder. 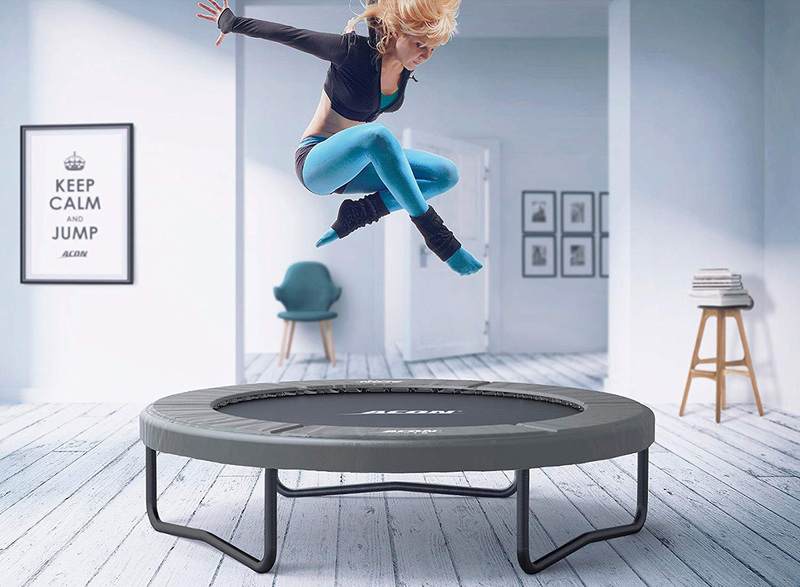 For slightly more you can get a great trampoline with extras such as weights and resistance bands – like Jumpsport Model 350 mini trampoline – that allow you to perform a wider range of exercises. The whole world of rebounding isn’t too expensive, so why not give it a shot? You’ll be pleasantly surprised by the results!